IMPORTANT NOTE ABOUT OBTAINING A REFUND: While our Eventbrite policy will continue to state ‘No Refunds’ we ARE OFFERING FULL REFUNDS due to the cancellation of this event. The person who made the original order simply needs to make a refund request in a message to us. Do this by logging into Eventbrite, then selecting the event and sending a ‘question to organiser’ message with a request for your refund. Refunds can only be made to the original purchaser of the tickets and the request must be sent from the person and email address associated with the order. For further details of when refunds will be processed see below. An extremely wet winter has left us in the unfortunate position that the land we use as the home of our event HQ and camping field remaining saturated to the extent that it can not, in it’s current damp condition, satisfactorily sustain the traffic that the event brings without significant damage. Further to this, the damp conditions pose further additional safety risks due to the high probability of vehicles getting stuck on access ways. A final site inspection over the weekend revealed that the water table is still extremely high and even if dry conditions persisted until the event date, the land would still be unlikely to be in a condition to sustain the event without significant damage. The Dyfi Enduro is a large event and finding an alternate location for 1000 riders, their bikes, family, spectators and their associated vehicles would be difficult enough but to find one close enough to our event route that would welcome this number on an already busy Bank Holiday weekend at short notice is a practical and logistical impossibility. For this reason, in the spirit of long term sustainability, we have taken the difficult decision to cancel the 2018 event. We understand that the cancellation will be disappointing for many people but the event puts its long term sustainability and the reduction of impact at the core of its principles so while we are sad not to be going ahead we feel this is absolutely the right decision for the land and the long term future of the event. All riders are offered the option to either receive a full refund or to carry their entry over to a guaranteed place in the 2019 event. For those who would like to obtain a full refund, please send a refund request through the Eventbrite message system by Monday April 23rd at 12 noon ( https://www.eventbrite.com/support/articles/en_US/How_To/can-i-get-a-refund?lg=en_US ). 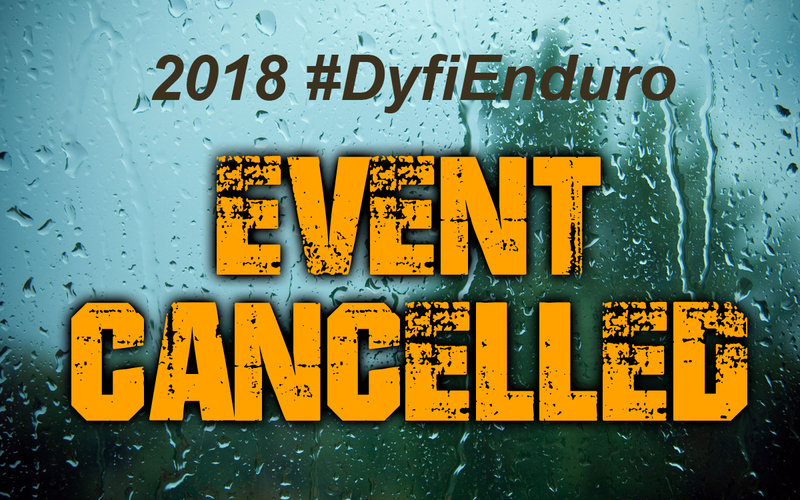 Entrants to the 2018 Dyfi Enduro have until this time to request a full or partial refund. Refunds will be processed from 23rd April until the following Monday, 30th April. If you have not received your refund during this period then please contact us and we will investigate. After this time, any remaining entries not refunded will automatically be carried forward to the 2019 event which will take place again on the first bank holiday weekend in May 2019 with the 2019 Dyfi Enduro itself taking place on Sunday 5th May 2019. Both event and camping fees will be carried over and entrants will not be subject to any price increases that may occur for the 2019 event. Our terms and conditions of entry and event waivers that were accepted for the 2018 event will remain in place for the 2019 event. Once all refund requests have been processed any resulting available entry spaces will go on sale in early January 2019. A exact release date/time will be published closer to the date. We would like to apologise wholeheartedly for any inconvenience the cancellation causes but please understand that the cancellation is due to environmental factors beyond anyone’s control. Our apologies too to our suppliers, helpers and supporters, many who have already worked hard and given time to the event. We thank you all for your support and understanding of the situation. We would like to say that we are extremely grateful to all who signed up to ride the 2018 event and are sorry the weather has put a damper on things this year. It seems ironic that after quite a few years of the event seeing damp trails with undeterred riders that it’s actually a damp field that scuppers things, but that’s life. We had a real corker of a route remix ready too, sadly this will have to wait until 2019 to be enjoyed by our riders but we can tell you now, it’s well worth the wait. If you have any questions regarding the event cancellation then please email mail@dyfievents.com but please understand that we will be extremely busy and it may take a day or two for a response. IF YOU REQUIRE A REFUND PLEASE MAKE YOUR CANCELLATION REQUEST THROUGH EVENTBRITE (see link above) BY Monday April 23rd at 12 noon . REFUNDS WILL BE PROCESSED BY Monday 30th April 12 noon. ENTRIES THAT ARE NOT REFUNDED WILL AUTOMATICALLY BE CARRIED OVER TO THE 2019 EVENT (THIS INCLUDES ANY EVENT T-SHIRT ORDERS, CAMPING AND CAMPSITE VEHICLE PARKING TICKETS).